If you have ever been to the mail room to pick up a package, you have likely seen the familiar face of Leo Leventhal. 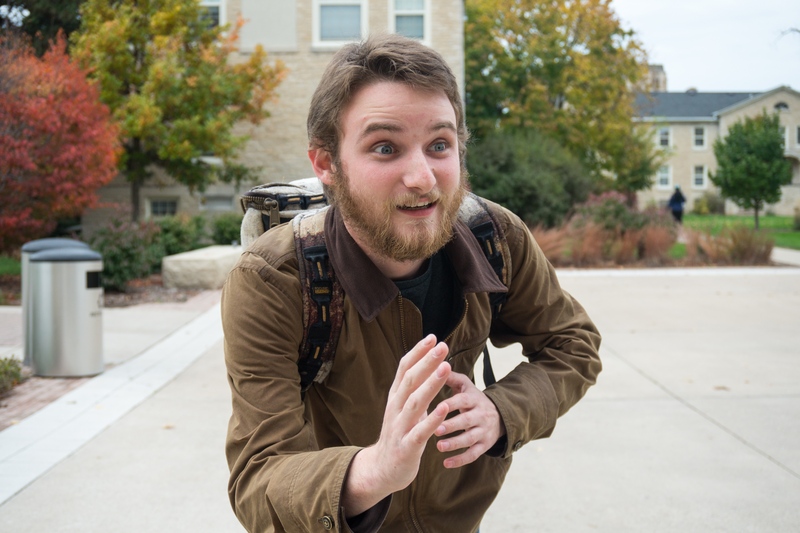 As a senior Film Studies major, he has explored numerous creative mediums in and outside of Lawrence. Leventhal’s senior experience, though, uses a medium that is brand new to him—one that, with the encouragement of a friend, he began learning how to create this term: the video game. An avid gamer from a young age, Leventhal is using his combined knowledge from many different creative avenues to make a video game about mental and emotional abuse and gaslighting. His passion for creating goes back to high school, where he dove into metal-smithing and ceramics as well as digital arts. His ultimate goal is to be able to create in any and every medium, and right now he is set on acquiring as many skills as possible. While he “wants to learn everything,” he also “doesn’t like school very much.” Leo was able to make his Lawrence experience fit him by picking classes where he knew he would have a certain amount of control. He has really loved taking animation classes in the past and is currently enjoying his printmaking class. Where there is freedom to create, Leventhal excels. While school may not be his favorite thing, learning is a passion of Leventhal’s. Just this summer he started learning how to embroider. All of his passions and outlets leave him very busy, but he still makes time to be a Trivia Master and participate in improvisational comedy. As to how he finds direction when creating, Leventhal said that what he does “just makes sense.” The force behind many of his creative endeavors is the love of making a world. To him, “all art is world building.” His previous experience with and continuing love for writing have been invaluable in creating his senior project. He explained that the making of a video game fits well with his creative sensibilities. Coming to Lawrence, Leventhal brought with him his love of writing and thought that he would be a writer one day. Now, he is putting his narrative skills to work in his senior experience. He sees the video game as an opportunity to make a narrative about something that matters to him. Along with this long-held passion, he is making the music for the video game as well. He described it as “nothing too fancy, just a way to create a tone and mood.” Leventhal finds that the different mediums “all come back together at some point.” Along those lines, he also explained that there is very little separation between disciplines. This makes it easier for him to incorporate many different skills into one project. While they meld together, the different mediums also feed one another and inspire Leventhal. They help to make the project as holistic as possible. While he has a collaborator who assists with the technical aspects of programming, Leventhal directs the project and has creative control. On having a partner, he stated, “it works because we have similar creative sensibilities and he respects my project.” Being able to create the animation, the story and the music while his partner focuses on the programming aspect of the project allows Leventhal to shape the project into what he envisions. Leventhal’s experience goes beyond the making of the game, to the content. As a victim of emotional and mental abuse, he knows how abusers operate and has a deep understanding of the dynamic of abusive relationships. Exploring this issue in a game space allows him to make it an interactive experience, as opposed to passive. This will allow people to really connect with the narrative. After the completion of the video game, Leventhal plans to put it online for people to download for free. The goal of this is to make people who have experienced abuse feel like they are not alone, and for others to understand more about mental and emotional abuse and gaslighting. He would also like to submit his game to competitions. Leventhal’s plans after graduation, though, are less clear. Ideally, he would be doing something that allowed him to create and express himself. He loves the idea of writing for TV, where he would be able to combine his film studies degree with his love for writing. However, he would settle for anything that pays. Leventhal definitely plans to keep learning more about not only video games, but about many more skills as well, allowing him to create with and connect as many mediums as possible. Although his future is open, one thing is certain: he will continue to be a student of life, always open to new possibilities and experiences.